On September 2, 1945, President Ho Chi Minh read the Independence Declaration, giving birth to the Democratic Republic of Vietnam, the first people’s democratic state in Southeast Asia. In face of untold difficulties in the first days of independence, the Provisional Government headed by President Ho Chi Minh steadily steered the revolutionary boat, having successfully organized the national election of deputies to the first National Assembly on January 6, 1946. Throughout 70 years of its history, the National Assembly has passed five constitutions: the 1946 Constitution, the 1959 Constitution, the 1980 Constitution, the 1992 Constitution and the 2013 Constitution. Each Constitution has marked the road of building and growth of the Vietnamese revolutionary state, institutionalizing the line of the Communist Party of Vietnam in each period of national development, serving as the foundation for completing the legal system and building a law-ruled socialist state of Vietnam of the people, by the people and for the people. On September 3, 1945, at the first session of the Provisional Government, President Ho Chi Minh underlined the necessity to build a democratic constitution for a new Vietnam. After more than one year of hectic preparation, the first constitution of the Democratic Republic of Vietnam was passed on November 9, 1946, by the First National Assembly at its second session. The 1946 Constitution comprises the Preamble, seven chapters with 70 articles, clearly defining the nation’s tasks to defend the territorial integrity, gain complete independence and build the country on the democratic foundation. It confirms three basic principles, namely the unity of all people regardless of race, gender, social class and religion; protection of the people’s democratic freedoms; and building of a strong and clear-sighted administration of people. It defines in Article 1: “Vietnam is a democratic republic. All national powers belong to the entire Vietnamese people regardless of race, gender, economic conditions, social class, and religion”. Moreover, the constitution confirms: All Vietnamese citizens are equal in rights in all aspects, political, economic and cultural; are equal before law and entitled to participate in administration and national construction, depending on their respective talent and morality. With such provisions, the 1946 Constitution confirms the emergence in Vietnam’s history of a people’s democratic state and acknowledges for the first time the freedom of speech, freedom of publication, freedom of organization and association, freedom of belief, and freedom of residence and movement in the country and abroad. From 1947 through December 1959, based on the basic principles of the constitution, the National Assembly, the National Assembly Standing Committee and the Government enacted 14 laws and ordinances and hundreds of decrees on national administration in the cause of resistance war and national construction. 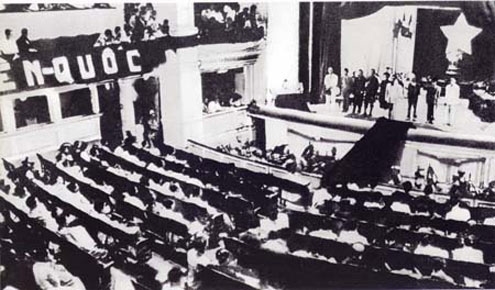 The National Assembly’s constitutional and legislative activities in this period laid the legal ground for the formation of a legal system of a new Vietnam - a legal system toward justice, equality, democracy and progress, approaching the noble ideals of mankind on independence, freedom, equality and humanity. After Dien Bien Phu victory in 1954, the North advanced to socialism while the South continued with the struggle to complete the people’s national democratic revolution. The changes in political tasks of the two regions made the 1946 Constitution inapplicable nationwide. Hence, at its sixth session (1957), the National Assembly decided to revise the 1946 Constitution to suit the situation and tasks of the Vietnamese revolution. After two years’ preparation, on December 31, 1959, the National Assembly unanimously voted for the 1959 Constitution at its 11th session, and on January 1, 1960, President Ho Chi Minh signed an order to promulgate the new constitution. The 1959 Constitution is composed of the Preamble, 10 chapters with 112 articles. 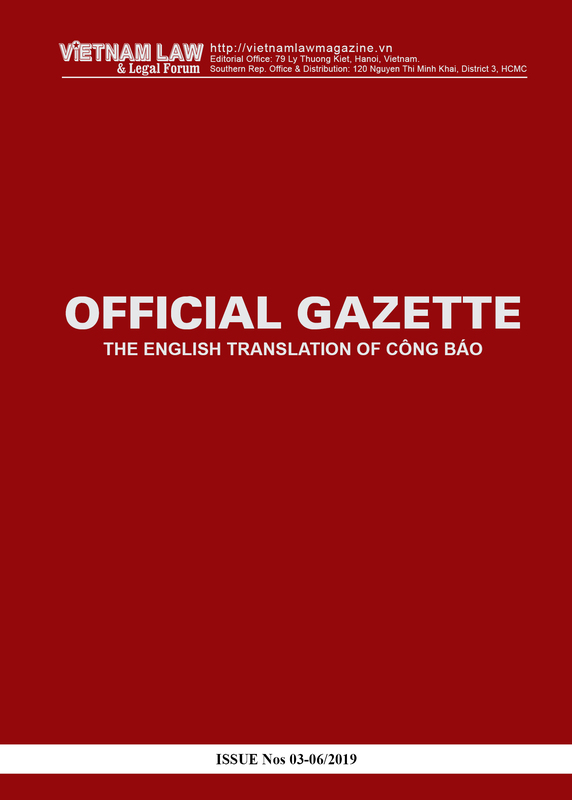 It affirms: “Vietnam is an inseparable unified North-South bloc” (Article 1); “The Democratic Republic of Vietnam... is a people’s democratic republic” (Article 2). The constitution provides the political, socio-economic regimes; the relationship of equality and mutual assistance among nationalities; the responsibilities and powers of state agencies; the rights and obligations of citizens, aiming to bring into full play the people’s great creativity in the cause of socialist construction in the North and the struggle for liberation of the South and national reunification. The 1959 Constitution is the first socialist constitution of Vietnam, being built on the basis of inheriting and developing the 1946 Constitution in conformity with the new stage of the Vietnamese revolution. With the 1959 Constitution, the National Assembly created legal grounds for building a legal system of the period of transition to socialism in the North. On the basis of the Constitution, from 1959 to 1980, the National Assembly enacted nine laws, and its Standing Committee issued 21 ordinances. Such laws focused on consolidating the organization and operation of the state apparatus, such as the Law on Organization of the National Assembly, the Law on Organization of the Government Council, the Law on Organization of People’s Courts, the Law on Organization of People’s Procuracies, the Law on Organization of People’s Councils and Administrative Committees at All Levels. Meanwhile, the ordinances concentrated on detailing the operation of the state apparatus and the punishment of dangerous criminal offenses such as infringement upon national security, infringement upon the socialist property, and bribery. The emergence of such laws and ordinances ensured the enforcement of the constitution, thus demonstrating the new step of development in legislative activities of the Vietnamese legislature and satisfying the requirements of state management and social management in this period. The Spring 1975 historic victory ushered in a new period of development in national history. The South was completely liberated and the people’s national democratic revolution was completed throughout the country. Our country was completely independent, free and unified and the whole country transitioned to socialism. As a result, the National Assembly once again undertook the historic mission of preparing a constitution for the new period of national development. On December 18, 1980, the VIth National Assembly unanimously passed the 1980 Constitution at its seventh session. The 1980 Constitution is composed of the Preamble, 12 chapters with 147 articles, providing the political, economic, cultural and social regimes, the fundamental rights and obligations of citizens, the organizational structure and principles for operation of state agencies. The Constitution spells out the relationship between the Party as leader, the people as master and the State as manager in the Vietnamese society. It reflects the period of transition to socialism nationwide and further creates legal grounds for building and developing the legal system. Concretizing the Constitution, from 1980 to 1992, the National Assembly passed 41 laws, the State Council issued 60 ordinances, prescribing the organization and operation of the state apparatus and regulating the social relations. Especially after the country embarked upon the cause of “doi moi” (renewal) in 1986, the National Assembly twice revised the Constitution: amending the Preamble at its fourth session (December 1988) and amending a number of articles at its fifth session (June 1989). The National Assembly enacted various economic laws, including the Land Law, the Law on Foreign Investment in Vietnam, various tax laws, the Company Law, the Law on Private Enterprises, the Vietnam Maritime Code, and the Law on Vietnam Civil Aviation, etc. The State Council issued many ordinances to regulate the socio-economic life as well as diplomatic, civil and penal issues. 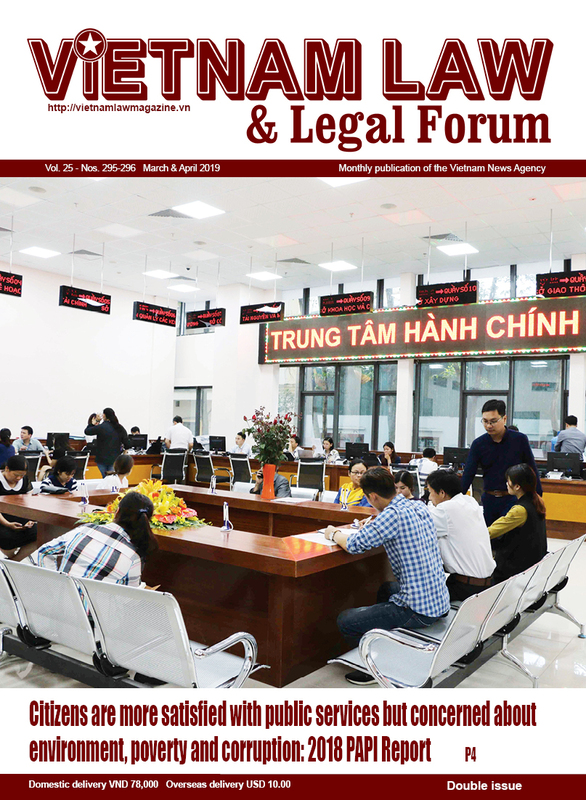 With the tireless efforts of the National Assembly and its bodies, the Government as well as concerned agencies and organizations, Vietnam’s legal system took shape, incrementally forming a legal corridor for national economic reconstruction and renewal of organization and operation of the state apparatus, thus laying foundations for building a law-ruled socialist state of Vietnam. By 1992, the cause of national renewal initiated and led by the Communist Party of Vietnam had been crowned with important initial achievements. At the same time, it also raised legal and practical matters requiring substantive and synchronous solutions. As a result, the National Assembly decided to revise the 1980 Constitution to meet the requirements of the new situation and tasks. On April 15, 1992, after more than two years’ preparation, the National Assembly passed the 1992 Constitution - the constitution of the initial period of national renewal. The 1992 Constitution is composed of the Preamble, 12 chapters with 147 articles, defining the political, economic, cultural and social regimes, defense, security, the fundamental rights and obligations of citizens, structure, and principles for organization and operation of state agencies, institutionalizing the relationship between the Party, people and State. Introduced in the first years of national renewal, the 1992 Constitution served as an important political and legal basis for carrying out the comprehensive renewal. With the 1992 Constitution, the National Assembly wrote in the constitutional history the initial fruits of the renewal cause, the orientation for better organization and operation of the state apparatus, establishing a new mechanism for economic management, liberating the productive force and paving the way for strong economic development while contributing to strengthening of national defense and security, stepping up external activities and international economic integration. At its 10th session, on December 25, 2001, the National Assembly adopted a Resolution on amendments to the 1992 Constitution, creating an important legal basis for forging ahead the renewal of the political system, completion of the state apparatus, democracy promotion and the building of a law-ruled socialist state of Vietnam. For the first time, the basic principle of guaranteeing the freedom of enterprise for organizations and individuals was enshrined in the Constitution: “Organizations and individuals of all economic sectors may conduct production and business in branches or trades not prohibited by law” (Article 16). The National Assembly and its Standing Committee devoted time, efforts and wisdom to the examination and adoption of various laws, ordinances and resolutions, attaching importance to urgent matters related to the economy, social affairs, education and training, science, technology, defense, security, and organization of the state apparatus. They included the Law on Organization of the National Assembly, the Law on Organization of the Government, the Law on Organization of People’s Courts, the Law on Organization of People’s Procuracies, the Enterprise Law, the Value-Added Tax Law, the Excise Tax Law, the Law on Domestic Investment Promotion, the Law on Foreign Investment in Vietnam, the Education Law, the Law on Science and Technology, the Civil Code, the Penal Code, the Law on Complaints and Denunciations, the Law on Drug Prevention and Combat, the Anti-Corruption Ordinance, the Ordinance on Thrift Practice and Waste Combat, and the Ordinance on Lawyers, etc. 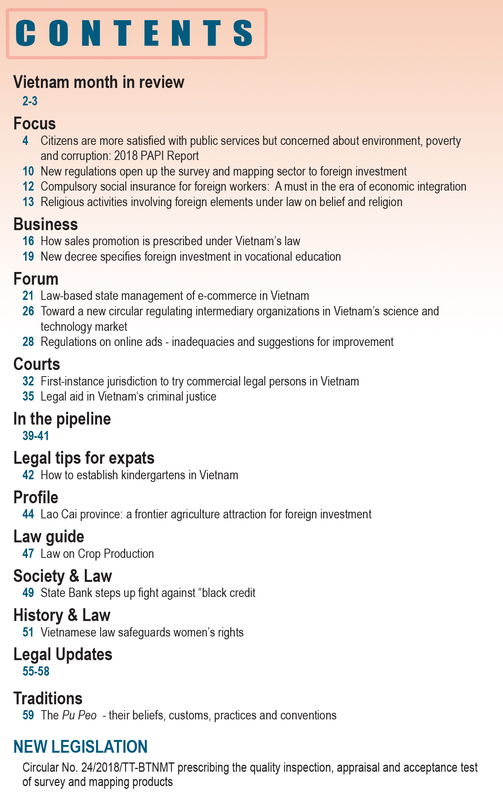 After 20 years of implementing the 1992 Constitution, Vietnam has obtained great achievements of historic significance. Given the international circumstance of great, profound and complicated changes, the Platform on National Construction in the Period of Transition to Socialism (supplemented and developed in 2011) and other documents of the XIth National Congress of the Communist Party of Vietnam have determined the objectives and orientations for comprehensive and sustainable national development in the new revolutionary period, aiming to build a prosperous, strong, democratic, equitable and civilized socialist Vietnam. At its first session (August 2011), the XIIIth National Assembly decided to revise the 1992 Constitution. After more than two years’ preparation, on November 28, 2013, the National Assembly passed the Constitution of the Socialist Republic of Vietnam with 97.59 percent of votes for. The 2013 Constitution has inherited the core and fundamental values of the 1946, 1959, 1980 and 1992 Constitutions. Being fully aware of the significance of the constitution and the role of the people in building the constitution, the National Assembly and its bodies and deputies tried their best to select the intellectual creams of the entire Party, entire people, entire army and compatriots at home and abroad for completion of the constitution. The constitution has demonstrated the “Party’s will and the people’s heart”, reaffirming the Communist Party of Vietnam’s role of leading the State and society while expressing the confidence, will and aspirations of the vast majority of the people for the Party, requiring every Party organization and every Party member to closely attach themselves to the people, serve them and submit to their supervision, take responsibility before the people and always operate within the framework of the constitution and law. The constitution highly values the human rights, the fundamental rights and obligations of citizens, promoting the role of the people as masters in building the state apparatus, and exercising the political, civil, economic, cultural, social, defense, security and diplomatic rights. It affirms the legislative, executive and judiciary powers; defines the basic principles for renewal and perfection of the state apparatus; ensures the assignment of responsibility, coordination and control of powers among state agencies; and delegates full powers and responsibilities to the National Assembly, the President, the Government, People’s Courts, People’s Procuracies and local administrations in running the country. The 2013 Constitution is the one of the period of comprehensive and synchronous economic and political renewal, meeting the requirements of the cause of national construction and defense as well as international integration. Various resolute measures have been taken to widely disseminate the contents of the Constitution to people to ensure that it is strictly observed. Two years after the promulgation of the Constitution, 64 laws have been enacted, covering all aspects of the socio-economic life. It can be reaffirmed that so far, the XIIIth National Assembly has fulfilled its mission, having promulgated the 2013 Constitution and basically completed the concretization of the spirit of the Constitution into the laws on organization of the state apparatus; protected justice, human rights and civic rights; completed the institutions of a socialist-oriented market economy; consolidated defense, security and social order and safety; and assured social welfare, environmental protection, external relations and international integration. Ho Chi Minh: Completed Works, National Political Publishing House, Hanoi, 1995, vol. 4, p. 440. Addition of the citizens’ right to stand for the National Assembly and People’s Council elections and the establishment of the standing bodies of provincial- and district-level People’s Councils while further intensifying activities of the People’s Councils and People’s Committees.